British Columbia's beautiful Shuswap Lake area has been enjoyed by visitors for years. Many years ago the Shuswap Indians, for whom the lake was named, travelled the waterways reaping the benefits of the large fish runs. Shuswap Lake resembles a rough 'H' in shape and is made up of four arms, the Shuswap Lake Main Area, the Salmon Arm, Mara Lake, Anstey Arm and Seymour Arm. This unusual pattern is caused by several intersecting valleys formed by the movement of ancient glaciers in the Shuswap Highlands. The surrounding area is largely made up of metamorphic rock where rockhounds will often find blue-gray and banded agate, crystalline geodes and amethyst. Forest cover is greatly affected by the diverse moisture patterns so tree species vary from cedar, hemlock, spruce, white pine and Douglas fir to poplar, birch and ponderosa pine. Living within the forest is a wide variety of wildlife such as the mule deer, porcupine, black bear, bighorn sheep, and caribou. Insects are common, making for an abundant and varied bird population. There are sixteen species of fish in the lake including kokanee, lake trout, Dolly Varden and burbot, all of which are popular sport fish. The Trans-Canada Highway runs near the southern shore of Shuswap Lake providing easy access to the area in which the parks are located. 1. Turn off of the highway at Squilax, near Chase, to find these parks: Roderick Haig-Brown (5 km from the highway), Shuswap Lake Park (19 km) and Silver Beach (60 km). 2. To locate Sunnybrae Provincial Park (6 km from Tappen) and Herald Provincial Park (13 km), take the road that begins at Tappen, near Salmon Arm.. 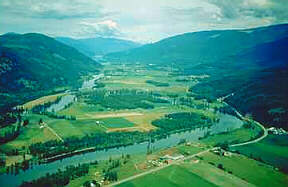 The Mara Provincial Park is located at the south end of its namesake lake on Route 97A, 12 km from Sicamous. Cinnemousun Narrows Provincial Park: This park is located where all four of the lakes arms meet and is one of the most popular stopping areas for visitors. The north side of the park is rather undeveloped, the south side is where the camping area is located. Beautiful beaches, shelters and a marine sani-station are found here. A 1.5 km trail leads the visitor to a viewpoint overlooking the lake. Roderick Haig-Brown Provincial Park: This park is known for its massive sockeye salmon run where 1.5 million fish crowd into just a few hundred acres of lake bed. Trails are located near the Adams River for viewing of the life and death spawning saga. Shuswap Lake Provincial Park: The Shuswap Lake Provincial Park is located on the north shore of the Main Arm of the lake. There are many day and overnight facilities provided for the visitor. The 272 site campground has a sani-station nearby. A beach, play areas and boat launch are found near the campground. Two kilometres from shore is Copper Island where there is a hiking trail that leads to the islands highest point giving the visitor a wonderful view of the lake and area. The forest cover once consisted mainly of Douglas fir and ponderosa pine but due to forest fires and logging most of the larger growth is gone. A thick second-growth forest of black cottonwood, white birch, aspen, Douglas fir and western red cedar can be seen here today. Albas: This beautiful area is located at the mouth of Blueberry Creek. There is a developed campground south of Blueberry Creek and an undeveloped site near the mouth of Celesta Creek. A trail leads the nature enthusiast through a forest of hemlock and cedar, past a series of waterfalls and remnants of the early logging days. Silver Beach Provincial Park: This beautiful area is located at the head of Seymour Arm. Vehicle access is good and interesting scenic attractions are found nearby in the forest of Douglas fir and aspen including the site of old Seymour City. Two Mile Creek: This camping area is the first one on the Seymour Arm. The forest of Douglas fir, hemlock and birch is home to abundant animal and birdlife. Anstey Beach: This secluded camping area is nestled into a forest of large cedars and cottonwoods at the mouth of the Anstey River. The trail leading to Hunakwa Lake is a nature lovers paradise. Anstey View: This spectacular viewpoint is found in a forest of Douglas fir, western white pine and birch. Four Mile Creek: On the east side of Anstey Arm is the Four Mile Creek campground. A meandering creek, small bay and forest of cedar and hemlock create a majestic setting. Herald Provincial Park: This park is found on the site of the Herald homestead, a family of pioneers who lived in the Shuswap region and farmed the land the is now the park. A picnic area, sandy beach and boat launch ramp are located near the campground. A trail leads through the forest to Margerat Falls. Marble Point: This camping area is located in the forest of cedar and hemlock. Marble outcroppings and an abandoned mine shaft are points of interest in the area. Sunnybrae Provincial Park: This picknicking, swimming and sunbathing site is on the northwest shore of Salmon Arm. Bastion Mountain is to the northwest and across the lake are the Larch Hills. Mara Provincial Park: Here on the east side of Mara Lake visitors enjoy a beautiful beach, picnic ground and boat launching ramp. To the east is Hunters Range, where 2200 metre Mount Mara is located, and to the west are the Larch Hills. as cross-country skiing and snowshoeing trails during the winter months.